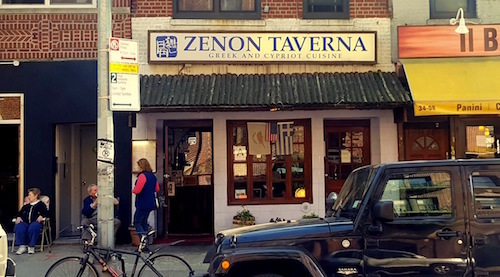 Even stepping through the doors of Zenon Taverna is a pleasant experience, a comfortably proportioned archway separates the entry from the main dining space, which is large but somehow feels like walking into someone's home. I initially laughed at the LED candles on each table, but after it filled up with so many dishes later I was happy to avoid so many opportunities to burn myself with all the shuffling that had to take place. Similar to what most westerners might refer to as tapas, a Cypriot Meze is a selection of small dishes and finger foods, brought in a first wave of cold items then successive plates of hot ones. With only two of us, the decision to go for the Kypriaki mezedes ($18.95 per person, minimum 2) was easy to make as it offered us the chance to try so many things. The first round of appetizers (above) had two significant standouts amongst all the normal Mediterranean dishes, the melitzanosalada and tzantziki. The former is a mashed eggplant dip laced with onion, garlic, and caper leaves, while the latter had more mint in it than the usual yogurt and cucumber dip it is, making it very memorable. There is far too much food for one sitting, and knowing what was still to come we tried to keep our bread consumption to a minimum while enjoying all the tastes. This did not come easy though, as the breads were so good. A generous salad (below) was also served with this round, consisting mostly of cucumber, tomato, and feta cheese. It was so good that I could come back just for a salad next time. We knew we were in over our heads for sure when the hot foods started arriving, including crispy-fried squares of halloumi goat cheese, the best calamari I had eaten in a long time, and quail (above) that had been marinated in wine, while the skin was touched with oregano and black pepper. 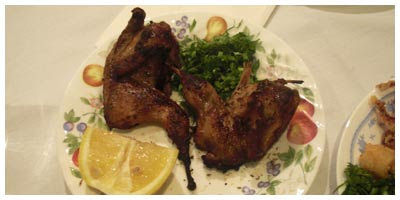 A smoked pork loin also marinated in wine was served, as well as a selection of souvlaki and meatballs (below). We hardly had room for this last dish, but it carries well and we took it home for lunch the next day. Throughout our meal, the dining room got progressively more full, until people were waiting for seats by the time we finished. We absolutely never felt rushed though, the staff remained courteous, even filling our waters seemingly inviting us to linger in perpetuity. After just a couple minutes to enjoy the grapes and oranges that arrived with our check, we relinquished our seats to make room, but it still felt good not to be pushed out.